I'm a list maker by nature. There's something very gratifying about knowing I have everything I need to remember written down so that I don't forget it. And it's even more gratifying when I get to scratch it off after completion. Most of my lists center around the obvious: the today's errands, what to buy at the grocery store, things to pack for a trip, etc. But sometimes I wonder if I need reminders of those things that are so blatantly obvious that I often look them over. When I heard the reading of items over my car speakers, I smiled. 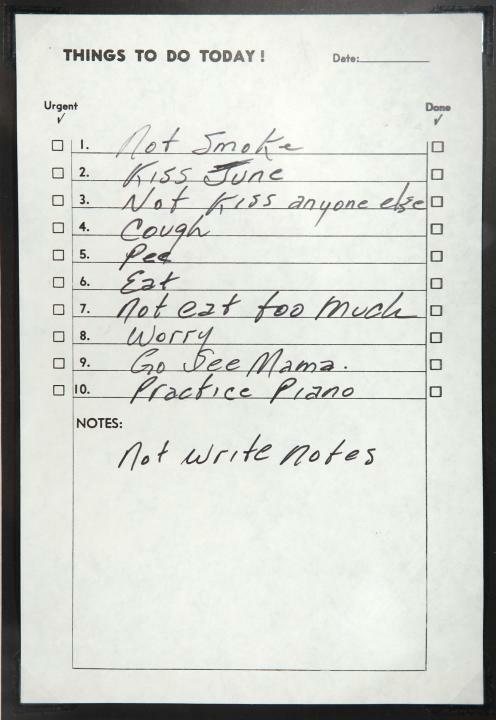 I love that Johnny made kissing his wife, June, so much of a priority that he went to the trouble to write it down. It made me wonder how often I forget the most important things. Perhaps I need to start adding them to my list. In a world full of hustle and bustle (especially during the holidays), it becomes so easy to forget to sit back for a minute and be reminded of all that truly matters. Perhaps I'll begin to appreciate my days more if I start and end them with remembrance of how fortunate I am to be so undeserving. Merry Christmas from the Reutters!